Abstract: Ancestry information at the individual level can be a valuable resource for personalized medicine, medical, demographical and history research, as well as for tracing back personal history. We report a new method for quantitatively determining personal genetic ancestry based on genome-wide data. Numerical ancestry component scores are assigned to individuals based on comparisons with reference populations. These comparisons are conducted with an existing analytical pipeline making use of genotype phasing, similarity matrix computation and our addition—multidimensional best fitting by MixFit. The method is demonstrated by studying Estonian and Finnish populations in geographical context. 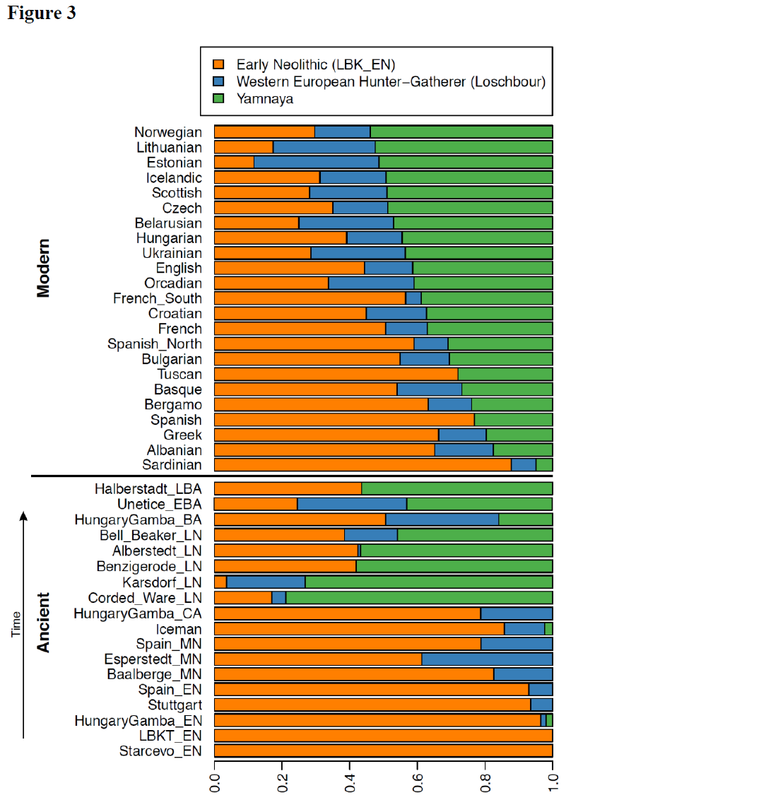 We show the main differences in the genetic composition of these otherwise close European populations and how they have influenced each other. The components of our analytical pipeline are freely available computer programs and scripts one of which was developed in house (available at: www.geenivaramu.ee/en/tools/mixfit). The paper's about kinship and social structure, and not geared for ancient population genetics. But the Y-chromosome haplogroups include R1b (7), I1 (2), I2b1 (2), and I2b, and the mitochondrial haplogroups include T2f (6), H2a2 (3), H1b, HV0*, U3a and U5a. Keep in mind that many of these samples are close relatives. Thirty nine modern-day and ancient test populations, fourteen outgroups, and only two rejected models (with perennial European outliers Chuvashs and Saami). Not a bad effort. It has to be meaningful. Interestingly, the only Neolithic sample that I could find to make this work, after an exhaustive search, was I1495 from the Mathieson et al. 2016 dataset. This is an individual from the Hungarian Plain dated to 4490-4360 calBCE, belonging to the Late Neolithic Lengyel Culture of East Central Europe. In other words, this person lived not too long before the massive Early Bronze Age (EBA) expansions from the steppes by Yamnaya and other such pastoralist groups. So it's probably not a coincidence that he fits the bill, because the steppe folk would have probably ran into his close relatives, and absorbed many of them, as they fanned out west across the European continent. 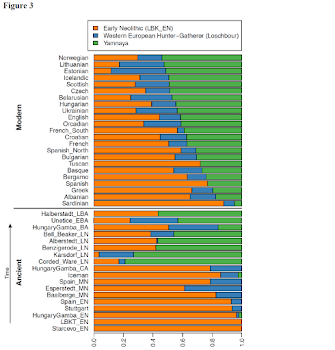 Also worth noting is that only a few European populations show extra Caucasus Hunter-Gatherer (Caucasus_HG) admixture at levels significant enough, say, >5%, to suggest that they may have acquired it independently of the pastoralist incursions from the steppe. They're all from Southeastern Europe, and include Albanians, Greeks and three out of the four Italian groups. It's an interesting question how they ended up with this extra dollop of Caucasus_HG, if they didn't get it from Yamnaya and/or related steppe peoples. One way to potentially test this is to look for temporally more proximate West Asian sources than Caucasus_HG, like, say, Armenia_EBA or Jordan_EBA, and see how they go. Indeed, Armenia_EBA improves the statistical fits for all of the Southeastern Europeans. Jordan_EBA improves the statistical fits for the Sicilians. To check my methodology, I also tested Germans and Poles with Armenia_EBA. These two North-Central European groups also show extra low level Caucasus_HG ancestry. However, their statistical fits are not improved by Armenia_EBA, which is not surprising considering their geography. Therefore, it's plausible that the Southeastern Europeans do carry Caucasus or Armenian-related ancestry that arrived in their part of Europe independently of the pastoralist incursions from the steppe. Based on the available ancient DNA, this may have happened at any time between the Late Neolithic and the Medieval Period, and via multiple population movements. We'll need a lot more ancient DNA to work that out. For a while now I've been trying to work out a way to model present-day Europeans with qpAdm as a mixture of Neolithic and Mesolithic populations. It hasn't been easy, because often what works for some Europeans doesn't work for others. But I've finally figured it out. The trick is to account for Siberian, East Asian and Sub-Saharan ancestry, by including the Nganasan from Siberia, Onge from the Andaman Islands, and Yoruba from West Africa, respectively, as reference pops. Below is the spreadsheet with the results and outgroups. Judging by the chisq and tail prob, most of the fits aren't spectacular, but as far as I can tell, they work. Moreover, in the entire analysis not a single standard error reached 2%. Based on my experience with qpAdm, that's a remarkable thing for such a complex analysis, and I think it suggests that the reference populations are relevant. 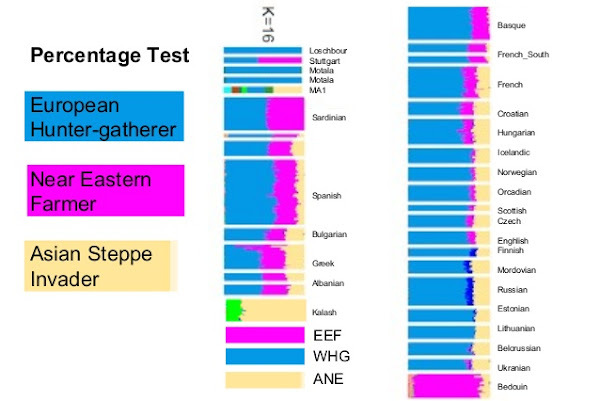 Interestingly, while, as expected, the Nganasan-related admixture peaks in far Northern Europe, the Onge-related ancestry is, perhaps surprisingly, most pronounced in Southern Europe. Any ideas why? My thoughts on that here. Update 014/01/2017: If you guys want to reproduce my analysis, but you don't have the same dataset, which is more than likely, you should be able to get very similar results using the full Human Origins dataset. Try these reference pops and outgroups. If you're seeing "infeasible", then remove the redundant reference population that might be causing problems, usually Yoruba or Nganasan, and run again. If it's still not working, then maybe your dataset is just too different in some way, perhaps with not enough markers (there should be around 200K SNPs available for these runs). The findings in this new paper at the Journal of Archaeological Science might help to explain the unusually high levels of Mesolithic ancestry amongst present-day Northeast Europeans. Abstract: Pottery was adopted by hunter-gatherers in the Eastern Baltic at the end of the 6th millennium cal BC. To examine the motivations for this cultural and technological shift, here we report the organic residue analysis of ceramic vessels from the earliest pottery horizon (Narva) in this region. A combined approach using GC-MS, GC-C-IRMS and bulk IRMS of residues absorbed into the ceramic and charred surface deposits was employed. The results show that despite variable preservation, Narva ceramic vessels were preferentially used for processing aquatic products. We argue that pottery was part of a new Late Mesolithic subsistence strategy which included more intensive exploitation of aquatic foods and may have had important implications, such as increased sedentism and population growth. Recent studies of ancient genomes have revealed two large-scale prehistoric population movements into Europe after the initial settlement by modern humans: A first expansion from the Near East that brought agricultural practices, also known as the Neolithic revolution; and a second migration from the East that was seen in a genetic component related to the Yamnaya pastoralists of the Pontic Steppe, which appears in Central Europe in people of the Late Neolithic Corded Ware and has been present in Europeans since then in a decreasing North-East to South-West gradient. This migration has been proposed to be the source of the majority of today’s Indo-European languages within Europe. In this paper we aim to show how these processes affected the Eastern Baltic region where the archeological record shows a drastically different picture than Central and Southern Europe. While agricultural subsistence strategies were commonplace in most of the latter by the Middle Neolithic, ceramic-producing hunter-gatherer cultures still persisted in the Eastern Baltic up until around 4000 BP and only adopted domesticated plants and animals at a late stage after which they disappeared into the widespread Corded Ware culture. We present the results of ancient DNA analyses of 81 individuals from the territory of today’s Lithuania, Latvia and Estonia that span from the Mesolithic to Bronze Age. Through study of the uniparentally inherited mtDNA and Y-chromosome as well as positions across the entire genome that are informative about ancient ancestry we reveal the dynamics of prehistoric population continuity and change within this understudied region and how they are reflected in today’s Baltic populations. In a recent paper and talk, archaeologist Kristian Kristiansen mentions a very early Corded Ware (CW) burial in Tiefbrunn, Germany; one of a few that contain a hammer-headed bone pin, like those found in Yamnaya and Catacomb graves on the steppe, particularly in the North Caucasus region. Sr isotope ratios suggest that the older man was non-local, while the young man and the child may be locals. The skulls of all three individuals exhibited signs of severe trauma and they had probably suffered violent deaths. The grave goods consisted of only a flint blade and a hammer-headed bone pin, laid down beside the older male. Such pins are rare in the CW of Central Europe, but common in the Pontic Steppe region where they occur in a variety of forms until they disappear around 2600 BC . All three individuals from this grave had their genomes sequenced as part of The Rise project and were labeled RISE434, RISE435 and RISE436. This is how they cluster in my Principal Component Analysis (PCA) of ancient West Eurasia. As far as I can tell, based on the Sr isotope ratios from Sjögren K-G, Price TD, Kristiansen K 2016, RISE436 is the older man with the pin and RISE434 the young man (see here). But if so, what is the likely non-local RISE436 doing as the most western of the Corded Ware samples sequenced to date? And why are the potentially local RISE434 and RISE435 so much more Yamnaya-like than him? My interpretation of these results is that RISE436 was the descendant of a proto-Corded Ware male migrant from the steppe, and that his mother may have been of pre-Corded Ware farmer stock from Central or East-Central Europe. Note that this individual belongs to the Eastern European Y-chromosome haplogroup R1a, Western European (?) 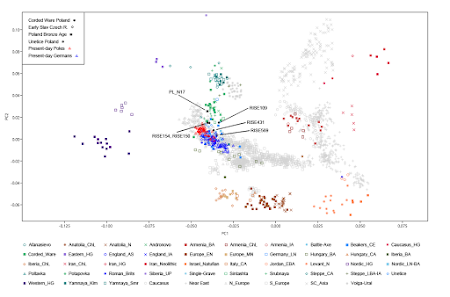 mitochondrial haplogroup U5b1c2, and on the plot above clusters almost exactly half-way between Yamnaya and early European farmers (Europe_EN and Europe_MN). On the other hand, the young man and infant may derive from a more fully developed Corded Ware community in Central Europe, largely made up of second and third generation migrants from the steppe. I just figured out how the Metal Age invader that never was came about. Take a look at this slide from an FTDNA presentation by Dr. Michael Hammer. 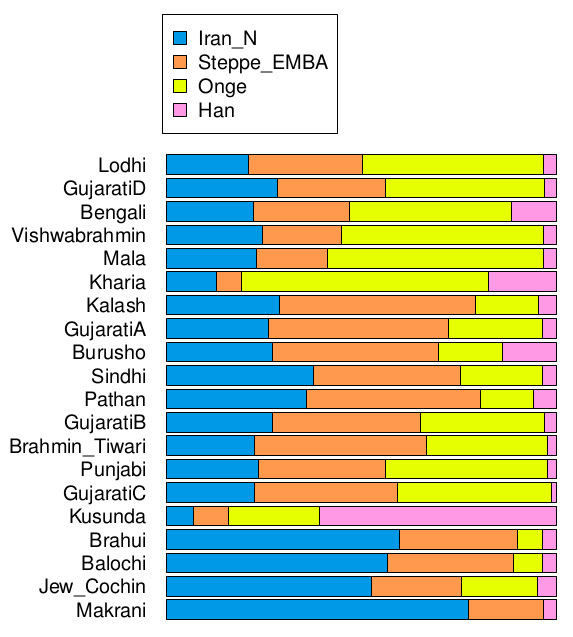 Hammer's taken the ADMIXTURE analysis from Lazaridis et al. 2013 and labeled the clusters according to what he thinks they represent. FTDNA then basically copied the analysis and the cluster labels for their "Ancient Origins" test. 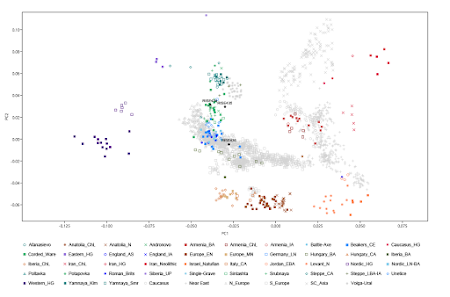 But those clusters do not represent what Hammer thinks they do, in other words ancient populations like Western Hunter-Gatherers (WHG) or Ancient North Eurasians (ANE). 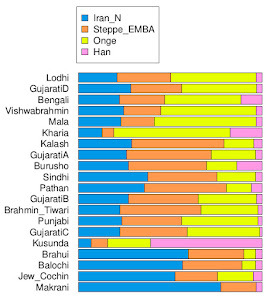 Ancient ancestry proportions are listed in other parts of the Lazaridis et al. paper, like table S.14.10. Moreover, Hammer appears to be under the impression that the Metal Age invader (that never was) came from Asia, and today it is the Kalasha people of the Hindu Kush who carry the highest ancestry proportion from this ancient population (that, of course, never actually was). First of all, the Bronze Age Yamnaya pastoralists and related groups (i.e. the real Metal Age invaders) expanded both into Europe and Asia from the Pontic-Caspian Steppe. Obviously, the Pontic-Caspian Steppe is located in what is now known as Eastern Europe, not Asia. Secondly, the Kalasha people carry about the same amount of Yamnaya-related ancestry as present-day Northern and Eastern Europeans, not three or four times as much, which, as per the figure above, is what Hammer seems to think. 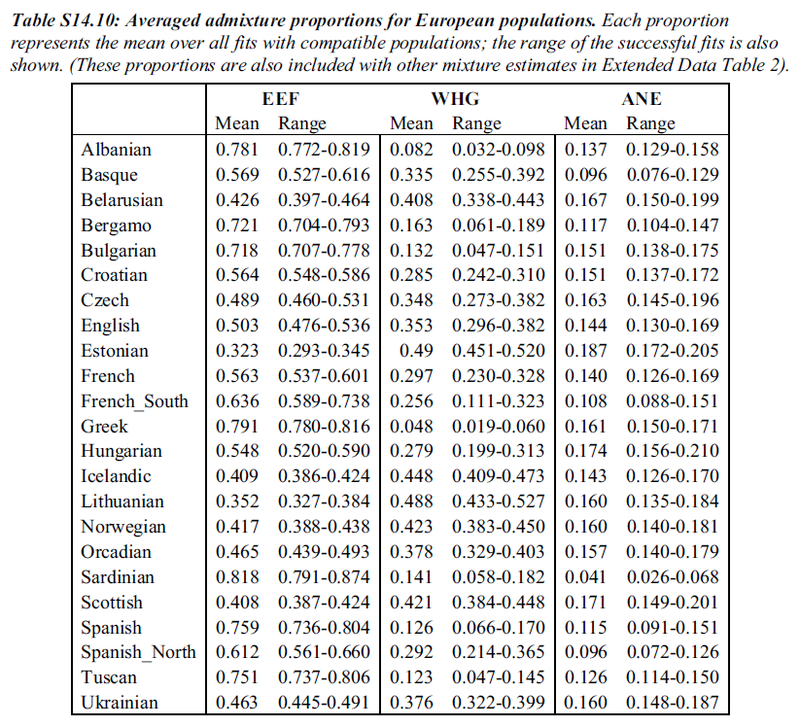 Formal stats-based Yamnaya-related (or Steppe_EMBA) ancestry proportions for Europeans are listed in Haak et al. 2015 and for South Asians, including the Kalasha, in Lazaridis et al. 2016. See below.